All anyone really needs to know about me is that I am passionate about family history. I started my own research about 25 years ago on a small scale. I worked it into a very busy life. Over the years I built a large collection of old family photos and artifacts that I am still cataloging. Of course my research continues. I am a native Hoosier, having been born and raised in southern Indiana. I and my youngest daughter are owned by Cali, a rather cranky feline who allows us to wait on her constantly. I am a seamstress and a quilter. My grandmother put a needle in my hand when I was about 5 and I never looked back. I also scrapbook many of my photos, though I have only been doing that for about 5 or so years. I collect pitchers and brownware pottery. Well, books too. I love books. Right now my bookshelves reflect the spiritual journey which has been my focus of late. 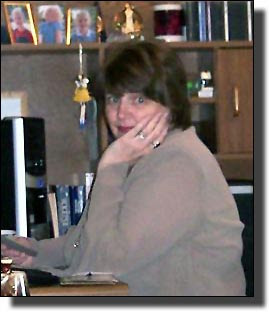 In December of 1999 I finally started my genealogical journey online! When I first discovered the GenWebs, I knew one day I would do that. In 2005 my home county came up for adoption. I applied and was accepted as the Jackson County INGenWeb Coordinator. My own rule is that as long as I am excited about the project I would remain coordinator. Three years and it is still just as exciting as it was in the beginning. I found out I didn't just love my family, I fall in love with everyone's family! Which brings us to the 'Unknown' and 'Orphan' photos. They are my newest project. Join Shades 10 October for Friday From The Collectors when we are treated to the outstanding work of Sheri Bush.